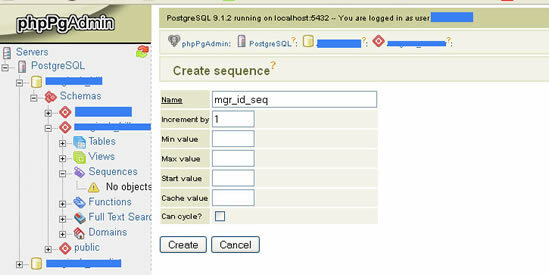 Unlike PhpMySQL, PhpPgAdmin does not feature a nice drop-down to auto increment on a column. This post will demonstrate how to auto increment on a column in PostgreSQL using either the PhpPgAdmin SQL Editor as well as how to make use of PhpPgAdmin GUI to do some of the work for us. The steps for using the PhpPgAdmin SQL Editor can be applied to using the command line (psql) as well. In our example we will create a table, Managers. Our table will have three columns: mgr_id, mgr_name, and mgr_email. For each insertion of a new Manager entry, we want to auto increment our primary key, mgr_id, by 1. Let’s start by using the command line. You can use below for the PhpPgAdmin SQL Editor as well. We now create the Manager table. For mgr_id, set as PRIMARY KEY and set the DEFAULT to NEXTVAL(‘mgr_id_seq’) as shown below. This will increment our sequence by 1 each time a new Manager entry is inserted. NOTICE:  CREATE TABLE / PRIMARY KEY will create implicit index "managers_pkey" for table "managers"
Step 4. Select on Table to View Sequence. As we an see from above, the increment begins at 1 and increments by 1 by default. Now, let’s take a look at how we can do this using some of the PhpPgAdmin GUI tools. Enter the sequence name as shown below.